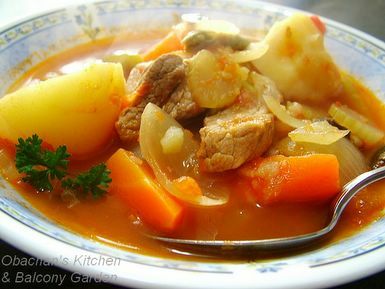 That's a very familiar stew from my childhood! I wish you a happy new year too. I hope your busy day at work still leaves you time to rest and enjoy yourself! very nice stew and it is a beautiful day today! Happy New Year, Obachan! I wouldn't dream of staying away! It's always a delight to see what you've got cooking, Obachan. And a very happy new year to you too.. Obachan..! My mother makes a stew very similar to that using ox tails. You are right, that looks comforting and nourishing! We wish you a happy and prosperous New Year, Obachan! Happy New Year Obachan! May you have a happy and propserous year in 2007. I'm really glad to have found your blog. I really enjoyed reading it! Thank you! Happy new year Obachan, I hope 2007 will be prosperous and joyful! Happy New Year, Obachan. I'm looking forward to another year reading your charming blog. Happy New Year, Obachan ! Oh, you had this kind of stew when you were small? I wouldn’t have liked this kind of vegetable-rich stew when I was a kid, but now it’s my favorite. Thank you. I wish you and yours the very best for the new year! Thank you so much for frequenting. Oh it’s so nice to hear from you. Sorry I haven’t been you your site for a while to see your lovely girl. Wish you a fabulous 2007! It’s very nice of you to come over and leave nice comments so often. Hope you keep coming back in 2007, too. Thanks. I wish you a wonderful 2007, too. Wish you a lot of wonderful happenings in 2007.